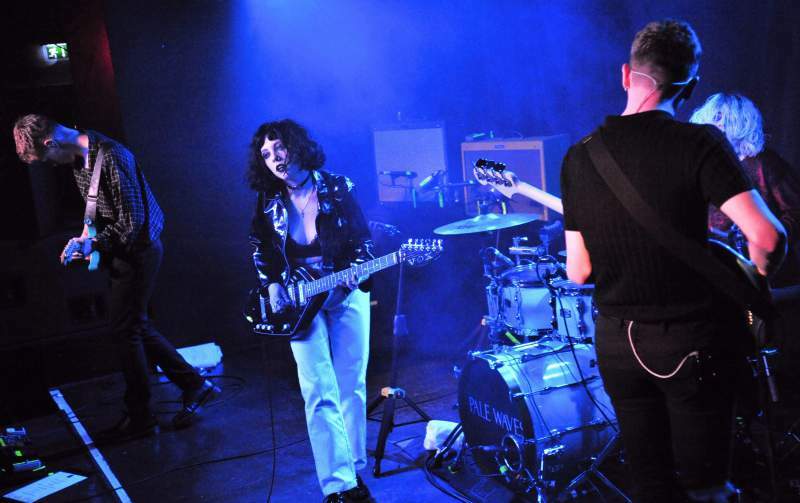 Pale Waves’ first headline gig in Newcastle is a perfectly crafted moment – short, and with songs as sweet as candy, leaving you craving another rush of sherbet. The Manchester foursome open with Television Romance, an infectious slice of guitar pop that has an appreciative and attentive audience singing along immediately. The band are tight and well attuned with each other and it’s clear to see that their recent US tour with The 1975 has honed their skills. Drummer and co-founder Ciara Doran propels the band along with a crisp, insistent beats, with the counterpoint of Charlie Wood’s elastic, melodic basslines and Hugo Silvani’s angular pop-punk guitar jangle. Singer/guitarist Heather Baron-Gracie has confidence and charisma, with a sort of undulating vocal style that has a little hint of Liz Fraser (Cocteau Twins). Baron-Gracie reportedly writes songs with movies on in the background and accordingly, every song sounds like the climactic moment of your favourite US coming-of-age movie – that moment when the protagonist sees the truth of the matter shining through and races to grasp their destiny. Kiss, The Tide, My Obsession all share that sense of alienated longing – sometimes lustful, sometimes rueful, but ever-yearning and innocent. Heavenly evokes New Order’s Temptation – a sort of danceable pining. Set-closer There’s A Honey is an unassailable anthem, instigating a mass singalong. The best pop songs are musically joyous, lifting your heart and moving your feet, with words of heartbreak, frustration, alienation, loneliness. And who but the luckiest-in-love among us hasn’t felt the party-time anxiety invoked in upcoming single New Year’s Eve: “I don’t want to be alone on New Year’s Eve / Do you even want to be with me”. These songs feel like a return to that time when it was normal for a great bands to be ‘popular’, to appear on Top of The Pops (think Orange Juice, The Cure, The Bangles, Tears For Fears). Pale Waves play shimmering guitar-led pop songs that are just made for singing along to, arms wrapped around your mates, dancing like crazy, lost in a moment where anything might happen.